Welcome, faithful readers (and those of you joining us for the first time) to the 118th installment of Cover Stories, the weekly column in which I, Jon B. Knutson, present a group of covers with a common theme (unless I'm doing an installment of one of the sub-series of Cover Stories, 1-10 or this week's installment)! But before we get into that, let's dip into the Cover Stories Mailbag! Another fun column... though being the nitpicker that I am, I couldn't help but point out the HULK # 156 WAS reprinted in Marvel Super Heroes, in issue # 104, one before the last. Zvi, you're a better man than I am, apparently! I typically use two different sources to check on whether or not a story has been reprinted... the Grand Comics Database usually notes where a story has been reprinted, plus there's Arthur's Marvel Comics Reprints Website (at http://www.math.ucla.edu/~alee/reprints.html), and while I checked the GCD, I completely forgot to check it against Arthur's site! First of all, Happy Anniversary! I vaguely remember my first anniversary. I met my wife 13 years ago yesterday (Vive le France!) and we've been married over 12 years. Congratulations to you, Zvi, and many, many more! I was a bit surprised you chose to show the cover of FLASH # 194, when Barry Allen's actual wedding took place in issue # 165. As I answered Zvi in a private email, sometimes the choices I make for covers for each week's column are pure happenstance. I have several folders on my computer's hard drive for each theme I've come up with, and sometimes I'll just grab four or five from them without thinking about how important they may or may not be. Heck, for all I know, I may have already used Flash #194 already, I just don't remember! Thanks for the emails, Zvi... and the rest of you, if you have any corrections or comments on this or any other column, well, my contact info is at the end of every column! This issue, number 41, was another favorite of creative team Joey Allen (writer) and Fred Michaels (artist). According to the notes I obtained from Jason Allen, Joey's son, this was another movie that they'd been chomping at the bit to adapt from the beginning of this series, and indeed, they'd actually started working on this adaptation nearly four years before it saw print! 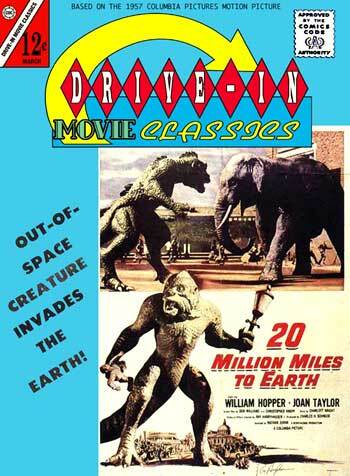 "20 Million Miles to Earth" was the current week's film on the TV show Joey and Fred were working on when they first signed on with Charlton to do the series, and since they hadn't received their first official adaptation to do, they started working on this one. They didn't do complete pencils on it, but Fred did do breakdowns for each page. Since this was their first try at doing any adaptation in comics form, they reworked the breakdowns over and over again, trying to pace the book out properly. Jason told me, "I remember dad reading this issue to me when I was little, and that they were more prepared for this issue than any other. Uncle Fred actually did all the art in a week! He must've felt freed up having those old breakdowns to work from." The idea of Fred working from breakdowns would resurface again just a few months later. 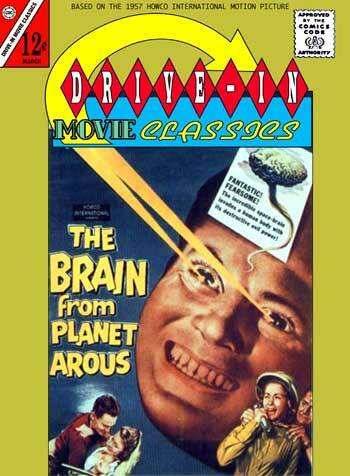 Here's issue 42 of "Drive-In Movie Classics," featuring an adaptation of "The Brain from Planet Arous." This was yet another of those "so-bad-it-was-almost-good" movies, bur rather than knock out a rush job on it, it appears that Joey and Fred decided to just let themselves go here! Fred's poses were melodramatic to the extreme (it almost looks like Fred's art here took some influence from both Jack Kirby AND Steve Ditko, if you can imagine such a combination). And while I haven't seen the movie this was based on in a long time, it appears that Joey played a bit fast-and-loose with the adaptation, too, making it even wilder than the original movie was! And I'm sure it was a happy accident that on the cover, the eyebeams lead right into the arrow for the logo! With issue 43, everything changed for a while, as the book went giant-sized, featuring two adaptations instead of just one! Charlton had once again revisited the idea of selling the books to drive-in movie theaters around the country, and the original price point of the books wasn't appealing enough when it was first proposed. Then, someone had the idea of making the books double-sized, and also printing one run of covers without the prices on them so that the theater owners could sell them for whatever price they wanted. This meant, of course, a change in the working practices for Joey and Fred. While Joey found himself able to script out two adaptations per month, Fred just couldn't handle doing the art breakdowns as well as finished pencils. Remembering how well issue 41 went for Fred, the duo started looking around for another collaborator... someone who knew comics, wanted to make a little extra money, did breakdowns well, and didn't want any credit. Now, none of the notes that Jason Allen provided me identified who helped with breakdowns, so I can't begin to even guess who they found, or even if it was just one breakdown artist or several! Some of the poses in "The Amazing Colossal Man" adaptation look vaguely like Don Heck's work, but I can't imagine Heck doing work anywhere but Marvel back then. The "Village of the Giants" adaptation, on the other hand, almost looks like Wally Wood might've had a hand in it, but it could've easily been done by any of the artists Wood trained to work in his style, but didn't sign on to work on THUNDER Agents for Tower. While having breakdowns didn't allow Fred to do the artwork in two weeks, he was able to still produce much faster than he had on average... and he even took the time to do the inks on at least one of these stories, if not both! The double-features continued in issue 44, but this time, neither of the movies was anything you'd call a classic, were they? Still, Joey and Fred (and their uncredited breakdown artist or artists) were having fun here, and also playing a little fast and loose with the adaptations, too! The creatures looked much better in the comics than they did on the big screen, and the plots made a little more sense, too! 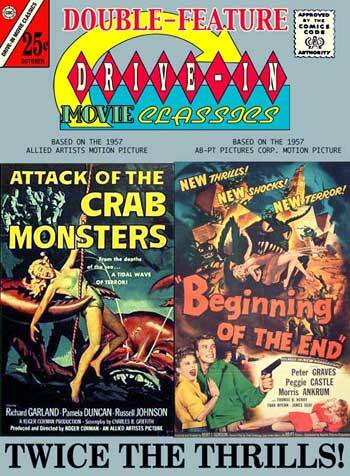 You may have noticed that the double features were themed, more or less... the first one featured giants, the second one featured crab-like monsters... and it would continue with the next issue as well! 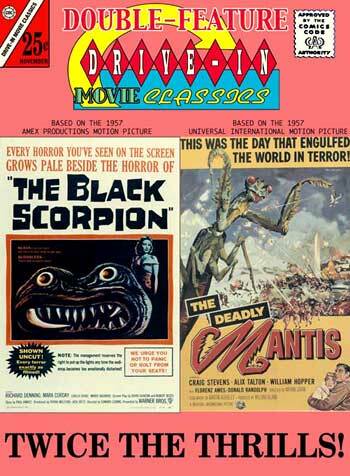 Issue 45's adaptations of "The Black Scorpion" and "The Deadly Mantis" featured two gigantic insects, and believe me, neither of these movies had to be changed much in their adaptations! Fred seemed to take particular enjoyment in making the title insects appear correct, instead of taking the usual shortcuts that comic book artists tend to take when drawing bugs. There was a little bit of a bonus in this issue, too: Apparently, someone miscounted pages when the breakdowns were being made, and the "Black Scorpion" adaptation ran a page too short. Rather than run an extra house ad, Fred came up with a "Fantasy Movie Poster" of sorts, featuring "Black Scorpion Vs. Deadly Mantis!" Now, THAT would've been a movie to see, eh? At least, I'm sure it would've been a fun "fantasy poster" to share with you as well, but for whatever reason, that page was missing from the copy of this issue I bought from Phil Serling's Alternate Reality Comics Shop, and if it weren't for the notes on this issue that Jason Allen had, I wouldn't have even known, since the other side of that page was a house ad! So that's the five issues of this title for this edition of "Comics They Never Made," so let's shut down the Kurtzberg Alternate Reality device, and get ready to look at comics you can actually find at a local convention... next time around!